Toddler - $13.99 Only 4 left! Small - $13.99 Only 6 left! Sure, there are more famous droids in the Star Wars universe than this C1-10P unit, but we sure can’t think of one with a cooler nickname. What does Luke Skywalker call C3PO and R2-D2 for short? “Threepio” and “Artoo.” Why, those barely even count as nicknames. That’s just dropping a letter or two off of each droid’s manufacturer-given full name. C1-10P, on the other hand, is more commonly known as “Chopper.” Now there’s a nickname a robot can wear with pride. Of course, it helps that Chopper’s history is just as cool as his nickname. For starters, he was never even supposed to be around for the rebellion in which he wound up playing such an important role. His model was considered expired decades before he joined the Republic Navy, and he kept on chugging long after he was adopted by Hera, the young Twi’lek with whom he’d later get tangled up in all manner of Rebellion adventures. For such a modest looking little navigational droid, he’s had a long and thrilling career of defending the galaxy against evil alongside legends like Ezra Bridger. Bring out the cranky old droid in your little one with this officially licensed polyester fleece jumpsuit, featuring Chopper-styled print on the tunic top and sleeves, plus a pair of fingerless gloves and attached boot covers. 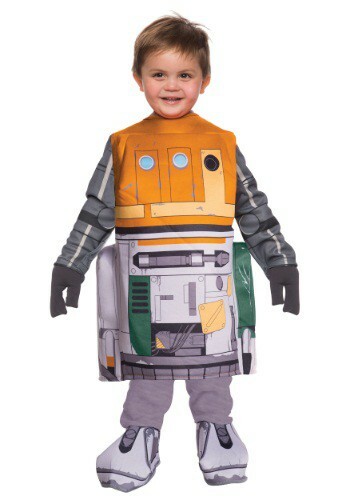 Given the way kids grow, this costume probably won’t last quite as long as Chopper himself, but for this season at least you’ll be able to do one the galaxy’s best-named robots proud.